For quite some time special needs strollers were not considered pediatric wheelchairs until now. 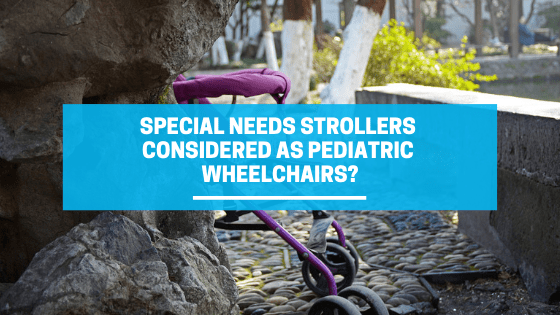 They are considered pediatric wheelchairs because they provide support that commercial strollers cannot. Strollers do differ from traditional pediatric wheelchairs in how they collapse and the type of support they provide, and the way in which they adjust to growth. This type of pediatric wheelchair is a dependant mobility device that is much lighter than most wheelchairs and offers complex seating. Strollers, also known as adaptive strollers, are typically used for young and older children who are unable to self-propel a manual or automatic wheelchairs. They are ideal for infants and children with special needs who cannot be supported in a commercial stroller. Traditional pediatric wheelchairs are often too wide and cannot offer special support that special needs strollers can. 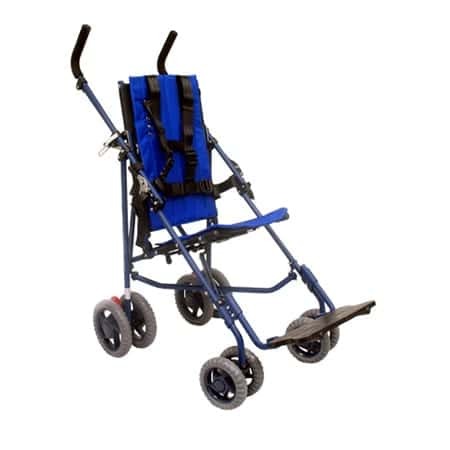 This type of pediatric wheelchair is lighter than most wheelchairs and have the ability to adjust shoulder straps to accommodate the back height of the end user. This allows for size accommodations for children and young adults. Special needs strollers often will include platforms for necessary medical equipment and will have more capabilities than a traditional stroller. Most special needs strollers are funded as medically necessary and may carry medical equipment, the same as the traditional wheelchair. Adaptive strollers have the growth capabilities to support up to 200 lbs. It has positional supports with includes an independent headrest. Strollers for children with special needs have the ability to tilt and recline the seating. The base is foldable like the traditional manual wheelchair, but it is not as rigid because the framing is different and lighter. In addition, they are specially designed cushioning and straps for the comfort and protection of the child or young adult. Wheelchairs come in all shapes and sizes, each made to meet a particular need. Special needs strollers have not always been funded as medical necessities like wheelchairs. However, the needs of children with a need for a particular support. Parents of wheelchair users often want to provide their children with the best care and life possible. Not only are special needs strollers an affordable and easy to manage option, but they are also aesthetically pleasing to some. This is often used as a backup to electric wheelchairs and manual wheelchairs, but when given a choice parents will typically choose the stroller. Do people prefer manual or electric wheelchair?